Pass Sheogorath's trial to earn his staff. Travel to Solstheim and enter The Retching Netch. Read the mysterious note and take the Fork of Horripilation. Kill the two specified bull netches using the fork and loot the artifacts from their bodies. Craft the Staff of Sheogorath using the Staff Enchanter in Tel Mithryn. Once you've installed the Staff of Sheogorath Creation, you will receive this quest and be instructed to travel to Solstheim. Upon arriving on the island, you will be directed to The Retching Netch cornerclub in Raven Rock. A mysterious note can be found pinned to a keg on the ground floor of the cornerclub, along with the Fork of Horripilation. The items will be hard to miss, as they are surrounded by a green glow before you approach. The note outlines a proposed combat challenge from Sheogorath, the Daedric Prince of Madness. You are instructed to use the fork to kill two specific bull netches on Solstheim, and recover two "familiar" artifacts from their bodies. Specifically, you will need to recover the Branch of the Tree of Shades and Ciirta's Eye, two items which originally appeared in the Symbols of Office quest in Shivering Isles. You must take the fork in order to accept Sheogorath's combat trial. Note that while the fork is literally a kitchen utensil and has very low damage, it is neither generic cutlery, which is not a weapon, nor the harder to find fork weapon, which is weapon type "other" - it actually has the dagger weapon type, allowing your skills and perks to interact with it normally (e.g. it will make no noise when sneak attacking), although both fork weapons do the same base damage of 1. It also weighs 12 times as much as a normal fork, equivalent to the weight of a Daedric Dagger. It has no enchantments. The first bull netch is located close by, on a small volcanic island directly east of the Earth Stone. Kill the beast as instructed and claim Ciirta's Eye from its corpse. The second netch can be found due east of Skaal Village, next to an icy waterfall. It will drop the Branch of the Tree of Shades when killed. Once you have obtained both artifacts, you will need to use them to craft your true reward: the Staff of Sheogorath. In addition to the two items obtained from the netches, crafting the Staff of Sheogorath will require two Heart Stones and access to the Staff Enchanter in Tel Mithryn. 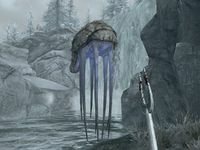 Heart Stones are readily available on Solstheim, and can be mined from deposits all over the island. Gaining access to the Staff Enchanter requires completion of the prerequisite Reluctant Steward quest for Neloth. You can avoid this prerequisite if you have access to a Staff Enchanter elsewhere, such as the one added by the Myrwatch Creation. 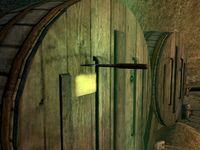 Once you have obtained the necessary crafting ingredients and access to the Staff Enchanter, you can craft the Staff of Sheogorath to complete the quest. The staff has a powerful area of effect paralysis enchantment. 10 There's something waiting for me on the island of Solstheim. I should travel there and investigate. 20 There's something waiting for me in Raven Rock, I should see what it is. 30 I've accepted Sheogorath's combat trial. I'll need to find these special Bull Netches, kill them with the Fork of Horripilation, and obtain the artifacts. 40 I've killed the Bull Netches and obtained the artifacts. I need to gain access to a Staff Enchanter and combine them to create The Staff of Sheogorath. 50 Finishes quest I have completed the trial, and crafted the Staff of Sheogorath. On the PC, it is possible to use the console to advance through the quest by entering setstage ccBGSSSE019_StaffOfSheogorathQuest stage, where stage is the number of the stage you wish to complete. It is not possible to un-complete (i.e. go back) quest stages, but it is possible to clear all stages of the quest using resetquest ccBGSSSE019_StaffOfSheogorathQuest. This page was last modified on 30 August 2018, at 17:49.